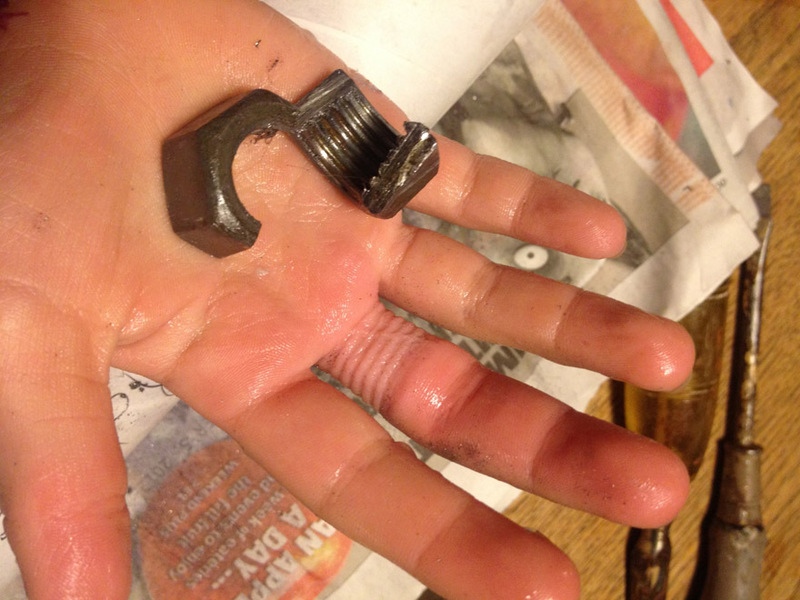 This is how to remove a threaded nut on your child’s finger (I think). Seven-year old Miya decided that this nut would make a great ring and managed to get it on her finger (I found out later that she had used soap and water to get it on in the first place – “because it was so tight”). The novelty of having a heavy nut on her finger wore off pretty quick however and she came begging for help. Removal proved to be problematic. The escalating removal techniques did not produce the desired results (first olive oil, then soap and water, then Windex, ice, elevation, and the final desperate dental floss compression wrap). Increasing panic ensued (“AAAGH get it OFF!! !” “I’m going to DIE!! !” etc.). 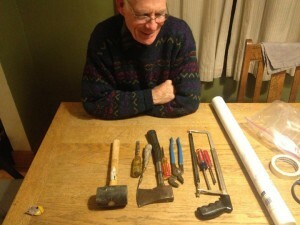 It was decided that the hacksaw would be the appropriate tool (angle grinder was voted down). It was a slow slog, but Miya calmed down considerably after a few saw strokes – I guess she could see that it really was going to come off. We finally got through one side of the nut (after a break for dinner) but it was too hard to pry open so we had to cut through the other side as well. You can also have your local firefighters take it off with the ring-cutter thingie. That might be a better choice.